Our house, Oakview, is a 1920s house built in the Arts & Crafts style – handmade clay tiles cover the external first floor, panelled wooden doors with original Bakelite handles separate rooms, a terracotta-tiled storm porch is supported by an aged oak beam, the original leaded, timber windows give views over the seven apple trees in the mature country garden. It was clear from the first time we saw Oakview that it was built with a care and an attention to detail typical of craftsman working in the early part of the 20th century. How then to respect, conserve and enhance this craftsmanship, while bringing the house into the 21st century, both in terms of function and design? This question has provoked many discussions between my husband and I, as well as many hours of deliberation and negotiation with the conservation officer in the planning department of our local authority. The debate is often driven by practicality and budget. To salvage and renovate the half-rotten, thermally-disastrous, original window frames would cost an eye-watering sum, and so we have made the decision to replace them with aluminium-framed double-glazing. In the existing house the new windows will have the same frame measurements as the originals, whilst in the double-height side extension we’re adopting a more modern glazing look with some large feature picture windows. I’ve written about choosing windows for a conservation area in my previous blog post. Sometimes the conserve vs update discussion is driven by aesthetics – take, for example, the clay hanging tiles on the exterior first floor of Oakview. The tiles are shot and must be replaced, but can we justify spending several thousands of pounds on a look we don’t really like? The answer is no. So we’re going to cover the first floor of the whole building in vertical larch cladding. We had to state this intention when we applied for planning permission and, as we’re in a conservation area, the local authority put a materials condition on the cladding element of our design. For this, we submitted architectural visualisations, specified what wood we’d be using and its provenance. We then had to cross our fingers and hope our neighbours wouldn’t object to this bold visual change. We were lucky and got the green light for the larch in the first week of the build. I’ve done lots of research into sourcing the larch – from online timber suppliers to visiting a local saw mill. We want five inch wide boards, 18mm thick and ideally we don’t want joins in each length. We’re going to hang them vertically, on top of a black membrane with an 8mm shadow gap between the boards – it should look sharp and modern, but, as the wood silvers over the years, the aesthetics will soften. The wood is going to be supplied by Copford Saw Mill, which, at only 25 miles away, means we can keep the delivery costs low. The owner, Harry, showed me their set up – a family-run, sustainable saw mill, which also has FSC certification. When I visited the mill, they had larch trees in stock – felled and stacked up – and, in this disconnected world where materials are often sourced virtually, I felt surprisingly thrilled to see the actual trees that are going to clad our home. Since I last posted, we have moved out of Oakview – wonderfully, we are renting the house exactly opposite. Not only do we have the luxury of not living on a building site, but it also means I can pop over daily to deliver coffee, material samples, measure up and answer any questions the builders have. The team is racing on with the project – the existing house is now a shell, with no ceilings, gaping holes in the roof where the chimney stack used to be and acrow props supporting openings where steels are to be installed. Two weeks ago we reached maximum demolition status, where everything that needed to come down was down and every room was trashed almost beyond recognition. Now we’re into the good stuff – seeing stud walls in the extension going up and being able to imagine how the space will work. We marvel at the skill of our plumber, Lee from Pevensey Plumbing, as he welds copper pipes around impossible-looking bends. We’re also ordering pendant lights for our electrician to install and choosing sanitary ware for the bathrooms. And yet, throughout this exciting stage, the tension between updating and conserving weighs on me. Oakview was the family home of the previous owners for 50 years and I don’t want to squander that heritage. Reassurance can come from many places, I have found. I celebrated my birthday last summer with a family picnic at a local National Trust property, Standen House, a brilliant example of an Arts & Crafts building. While my birthday cake digested, my husband gave me the best present: half-an-hour of not telling off our two young children for trying to pop the fuchsia buds in the borders, so I could wander through the house admiring the beautiful William Morris wallpaper, the splendour of the orangery, the perfectly-chosen handcrafted furniture. This description perfectly encapsulates everything we want to do with Oakview, I couldn’t have written our ethos more accurately myself. We will be sticking to our core materials – wood, glass, stone, concrete and Mother Nature – to create an “informal but cultured lifestyle”. I daydream about sashaying about in our open-plan kitchen on a Sunday morning brewing coffee, whipping up pancakes for the kids and reading the Guardian – what could be more informal and cultured than that? I’ve even preemptively bought myself a green silk kimono in which to sashay. 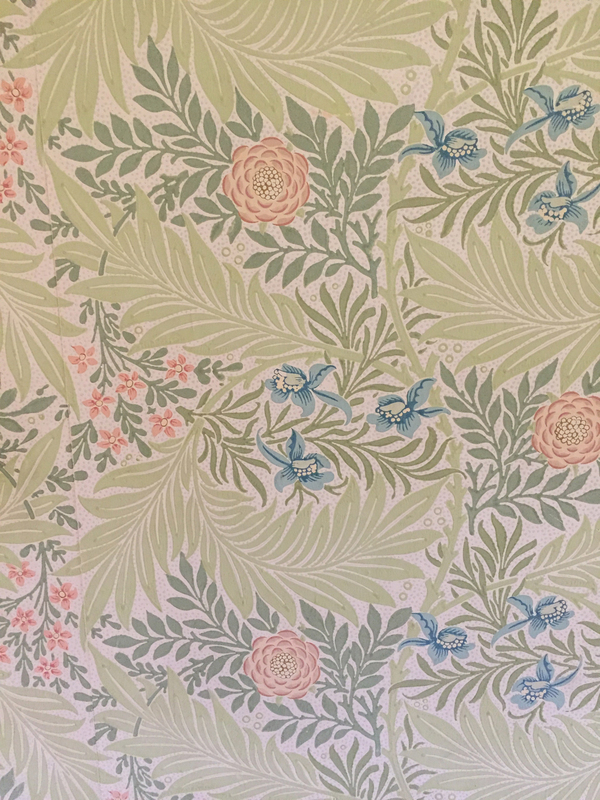 Although we are updating and modernising many elements of the fabric of the house, it will be the finishing touches which bring its Arts & Crafts DNA to life. The framed botanical prints, our antique wooden rocking chair, corners of rooms filled with foliage plants in wicker containers, my potter sister’s hand-thrown crackle-glazed vases on the window sills, artwork and prints collected from family summer holidays to Denmark adorning the walls. These small, carefully-chosen, mindfully-created pieces are, to my mind, what exemplifies the Arts & Crafts approach. I agree with William Morris who once said “Have nothing in your houses that you do not know to be useful or believe to be beautiful.” I hope he would approve of our plans. I’ll think of his words as I adjust one of the underfloor heating zone manifolds whilst wearing my silk kimono, the smell of coffee pervading the house.